More than 50,000 children die in Nepal each year, with malnutrition as the underlying cause for more than 60 per cent of these deaths. Half of the children in Nepal are underweight and three-fourths of the pregnant women are anaemic. The detection of a few cases of wild polio virus in 2005, following five years without any case, indicates the challenge for cross-border transmission along the border with India. Fifteen per cent of Nepal’s wells are contaminated by arsenic. Despite Nepal's high overall coverage of accessibility to drinking water, access to improved water for deprived, disadvantaged communities and conflict-affected rural and fringe urban areas remains low. Two-thirds of Nepalis are still without access to toilets. Maternal mortality rates are high due to weak health systems with limited access to emergency obstetric care, skilled attendance and the overall poor status of women. Neonatal mortality rates are also unacceptably high due in part to lack of community awareness on appropriate care of the newborn. The conflict has had a significant impact on education. Forced closures of schools due to strikes have cut the school year in half in some areas. Teachers have been threatened, assaulted and even killed. Thousands of students have been taken from school for political indoctrination, and some have been recruited into the Maoist forces or militia. That being said, it is interesting to note that there is a growing middle class and most people who can afford to send their children to private school do so. Even parents who are clearly not in the ‘middle class’ work hard to be able to send their children to private schools. The kinds of children who cannot go to private school, and sometimes no school at all, include children from very poor families. One day my driver had mechanical problems with his motorcycle because some of the village boys had tampered with a tire and we had to take it to a nearby repair shop. The boys actually did the work. Boys will be boys and just like in the west, some boys cannot sit still long enough to study in a classroom or maintain long enough to help on the farm. Sadly, sometimes the parents get so exasperated with them that they take them to Kathmandu and leave them on the streets. Sometimes the boys are beat so badly they just run away and end up here. I can smell the glue on the boys as they come running up to get a hug and a possible meal. Hugging them or touching them is not advisable. The scam I personally fell for was the ‘Can you buy some milk for my little brother?’ scam. When you buy the milk, dry milk for 1,100 NRs., they will simply return it to the same store for about 50% of what you paid and buy glue. If you must buy food for these street urchins be sure to open it so they cannot return it, or better yet, take them for a plate of mo:mos. They may look like children, but they are actually drug addicts, so be forewarned. That being said, I must confess that they captured my heart and I’m working on a project to help get them off the streets. Notice the plastic bag; it’s filled with glue. On this particular day we were to visit a social worker and orphanage that I had read about a few months ago. This young woman, Pushpa, comes from an upper middle class family. Her father has worked very hard with his business for over 40 years. Now they support this home where she takes care of about 40 children whose parents are in a Nepali jail or prison. You see, there is no foster care program in Nepal, so if a mother goes to jail she must bring her children with her or find someone to care for them. The children get neither food rations nor an education while they are in jail. I was very impressed with the way the children are taken care of. The home and grounds are quite nice and very clean. It is surely an upgrade to the life they would have even if their mothers had not ended up in jail. They are even placed in private school. As harsh as I am in Nepal: On a Budget about NGOs, I think this is an amazing NGO. For one thing, Pushpa is a volunteer and lives with her parents who help to support the centre. That is way out of character for many Nepali NGOs. Generally the NGOs are run by overweight men who have no hands on contact with the children and who keep the lions share of any funding. One such 'social worker' told me he had tried to work with the glue boys, but they didn't want any help. When I asked him what techniques he used he replied, "I told them not to do drugs." No, I didn't make this up. After our visit with this home (not referred to as an orphanage) we stopped in at the Civil Mall. I had heard that there is an arcade on the fifth floor for children. I pictured video games and such. What I saw was more like a McDonald’s playground. The entire floor is devoted to entertaining children up to 12 years old. The tickets for the games are only 10 NRs. It was during school hours when we were there, but it looked like so much fun for children. If you come to Nepal with a child he/she will really enjoy the experience. While we were at the Civil Mall we took the escalator up to the 7th floor for additional treats. This floor is devoted almost entirely to teens and I had no idea there were so many affluent teens in Kathmandu. One Nepali man who went to America came back with an American idea. If you go to the Civil Mall give Choco Berry a try. As you can see by these pictures Choco Berry serves soft frozen yogurt with a full, self serve sundae bar. My assistant, Bishnu, had strawberry flavor and I had the white, tart flavor. The cost for two small sundaes was 277 NRs., about $3.00, or about half the price as it would cost in America. It’s a full-blown teen paradise up there on the 7th floor. Whether you bring kids with you or you are a young volunteer/trekker with a little time in-between activities, particularly when it is a heavy monsoon day or a cold winter day, you will want to go to the mall. There is also a cinema there showing American and 3 D movies along with Nepali and Hindi movies. Again, you will pay about half of what you would spend in America. If you didn’t know you were in Nepal already, walking in the mall could fool you into thinking you were back home-that’s how western it is. For my fellow 'frugal' travelers you probably already know the mall is not a great place for bargain shopping. If you want to do shopping while you are in the area (Ratna Park) there are some great places nearby. There is the Chinese area and places the locals shop for great wholesale prices within walking distance to the mall. Ask someone to point you to Arson Chowk if you are up for major shopping. You just walk along the crowded streets until you see something of interest. One day I met a man with a stack of pashmina scarves that looked very plush. He wanted 2400 NRs. for six nice scarves that looked very expensive to me. The problem was twofold, they were all identical since it is in the wholesale area and I was completely down to my last ATM withdrawal for the month. That was the best buy I had ever seen on scarves, but you just never know what you might find there. I've been scouting around for more great bargains for my book, Nepal: On a Budget, so about a month ago I bought fabric to make a queen size sheet set for 750 NRs. The problem is, even though it only cost an additional 150 NRs. to have it made into sheets, they have no concept of a fitted bottom sheet. It was nice fabric-15 ft. by at least 6 ft. It is not just for status, that private school is preferred. Government schools are not necessarily conducive to getting a good education. For example, about 8-10 months ago I visited a government elementary school. Although there were many children in attendance there didn’t seem to be much learning going on. They gladly disrupted class to get the paper and pencils I had brought them. The vice principle also stopped what he was doing for the photo op. One thing that seemed strange to me was that he was the English teacher yet he was unable to communicate with me in English. Unfortunately the pictures got destroyed. Life can be very difficult for the people, but the children seem to take it all in stride. However, no matter what happens it always seems to hit the children and their mothers the hardest. The statistics quoted at the beginning of this blog post refer mostly to children in the rural areas of Nepal. Here in the valley the children have it much better. They seem quite happy and even a bit spoiled.These boys just stripped down to birthday suits and jumped into one of Bhaktapur's pokaris, the large natural ponds on a hot, summer afternoon. These ponds are not for swimming due to the 'quick sand' bottoms that can cause a person to drown if they go too far out. No one seemed to be supervising these boys and they were very well behaved. These children were playing Leap Frog on a nearby roof. They were unsupervised and seemed to have a great time. This scene could never happen in the US. There is no safety rail and no one to tell them to be careful. This is Nepal and the children learn very early to take responsibility for their actions. This is the view out my window and it looks quite different from a few months ago when the entire field seemed to be lit up with mustard greens. After the last of these plants were harvested the field began to look very dry. It is sad to think of one of the water richest countries on the planet having so many problems with water. But when it rains we get immediate rewards of more electricity and the people can live like they have for thousands of years by working the fields. Over 60% of the people in Bhaktapur earn their livings through agriculture. We have been experiencing the beginning of a possible drought and many people ran out of drinking water and the municipality provided a free truck of drinking water, not that it is the purest water. At one point they were lined up for quite some distance, but this picture was taken about an hour or so after the truck came. The sky seemed to have finally opened up and perhaps the worst of it is over. I woke up to the most joyful sound ever last night! It was raining so hard it didn’t seem like there was much air in-between the drops. I hope that was the beginning of a nice monsoon. Kids will be kids and it seems to me that the children in Nepal can have a lot of fun no matter where they are. 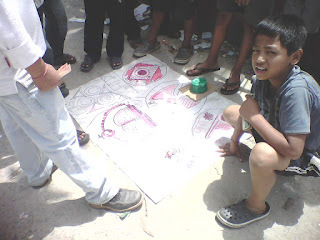 Here is a group of children playing a gambling game on the street. It seemed like they were having a good time. As we finished up our day, we happened upon a woman street vendor cooking up some goat lung. I had to have a taste and it was less than spectacular for me. Bishnu enjoyed it. It didn’t taste quite like meat and the texture wasn’t quite to my liking, but the young woman cooked it fresh as we waited and neither of us got ill. I don’t remember how much the bowl cost, but it was well under $1.00. I did see a pile of really disgusting garbage not ten feet from where she set up her little restaurant, which was a little more worrisome. Hey, it’s Nepal! If you are planning a family vacation abroad and wonder if bringing youngsters is a good idea, I assure you that the children I’ve spoken to have really enjoyed their time here. I always try to ask families that bring children and I’ve yet to get a negative from either the parents or children. There are several suggestions in my book, Nepal: On a Budget, for activities with children. I also have excellent medical solutions should any problems come up. Coming to Nepal at an early age could be the most significant vacation a child could experience. Bottom line: Come to Nepal and bring the kids!